On October 1, the Pharmacy Department within Mozambique’s Ministry of Health successfully launched Pharmadex—a major achievement, and a significant step toward making the country’s medicines registration system more effective and transparent. Pharmadex, a SIAPS-supported web-based tool, supports a more efficient medicines registration process by organizing and housing all relevant information needed for an application to be processed, thereby helping to monitor the progress of the application as it moves through different levels of approvals. 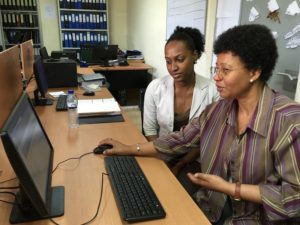 Ministry of Health staff in Mozambique learn how to use Pharmadex for medicines registration management. After collaborating with ministry stakeholders to understand the limitations of the previous medicines registration system, SIAPS customized Pharmadex to adapt to and best serve Mozambique’s specific country context. SIAPS then conducted an intensive training for Pharmacy Department staff and worked to ensure each staff member understood and was able to use Pharmadex to support the medicine registration process. With Pharmadex, the Ministry of Health can now manage medicines registration applications in one centralized online system that will support and coordinate database storage across multiple regulatory units, facilitate the sharing of pertinent application and licensing information, and provide a comprehensive picture of a product’s safety profile, approval history, and inspection reports. Pharmadex is also being implemented—or is slated for implementation—in Ethiopia, Bangladesh, and Namibia.